The restored bar at Ruins. The tiny building on the corner of Monroe and Mallon was actually pretty close to ruins when local chef Tony Brown took on the task of reviving it earlier this year. There were leaks in the roof, holes in the walls and eyesores throughout, like a the buffet line from the previous tenant, a Mexican lunch spot, where the original maple-topped bar stood. But to those who stopped by Ruins during its quiet opening a couple of weekends ago, nothing would indicate the historic building's former deterioration. Paying homage to its late Art Deco style, Brown's family and friends broke out the elbow grease to refurbish the 36-seat eatery. The exterior now boasts a rich brown color, a bright, teal-colored door and inside, dark but inviting navy-colored walls. 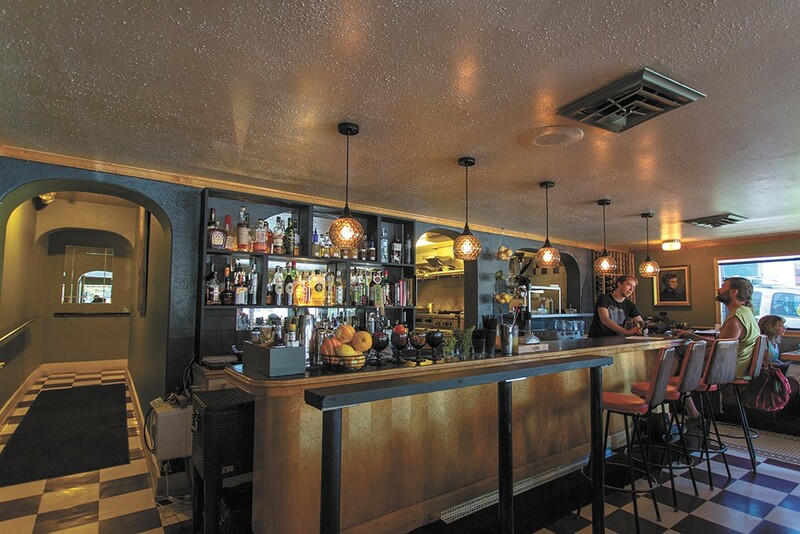 Original tile and woodwork is complemented by plush booths lining the perimeter walls. A cozy cocktail bar headed by Crystal Bertholic, formerly of Bon Bon, offers views of Brown at work in the kitchen through a pass-through. Just as when Brown and mom Marti opened their nearby sandwich shop Stella's Café more than two years ago, word of Ruins' opening was spread quietly but quickly by friends, family and faithful followers of the Browns' concept at Stella's. "I always have a fear of things not working, and that no one likes it," Tony Brown confesses. "If it was to fail, I'd rather it be with friendly faces than on a large scale." Early signs show otherwise. Though a sign at the entrance was waiting to be hung, on a Wednesday evening Ruins' intimate dining room felt like an episode of Cheers — friends and casual acquaintances greeting each other warmly, and eagerly inquiring what to sample first. To dine at Ruins the way Brown intends, order a dish from each section of the brief, continually changing menu. "I hate the word tapas," he says. "This is in between an entrée and tapas, and the idea is for people to try a little bit of everything. It's also geared toward that we're a bar, and it offers snacks rather than a full dinner." Sharing, snacking, eating a full meal or not, Ruins' locally sourced, seasonally rotating plates are ideal for all. For now — Brown already has swapped a few items in and out — the menu is organized by salads, small plates, sides and dessert. Small plates, like Andouille sausage with toast and mustard ($7) and barbecued tofu with succotash ($6), offer heartier portions, but are small enough to not overfill with a complementary side — some sautéed kale ($4) or potato croquettes ($5). Save room for the day's featured dessert item ($5), which could be a glass of milk with one of Marti Brown's homemade cookies, or some homemade peanut butter ice cream sandwiched between two.